Famished by the time we reached, we chanced upon this while on the search for a place hoping to avoid the snaking long queues everywhere in Vivo City. Located in a quieter corner just outside Daiso, we decided to give it a shot since I've had quite a good impression of Imperial's Peking Duck concept earlier. A quick research while doing up this post then uncovered that it isn't part of the Imperial Treasure Group, and is in fact a standalone establishment that used to be at Metropole Hotel, starting the only restaurant to give health diagnosis by their in-house Chinese physicians. It is thus no wonder that you see them selling several herbal products, a menu page on herbal benefits and even have a stand that resembles that of a Chinese medical hall. Stepping into the restaurant, I must say it's quite a nightmare for interior designers, irking even the laymen like us quite a fair bit with the super mismatched designs and decor. 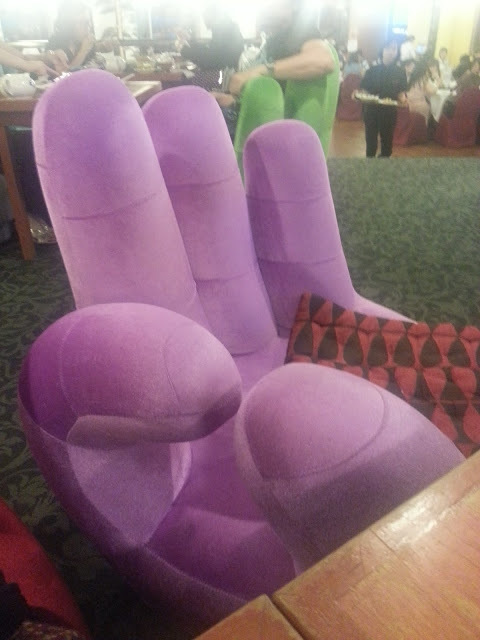 Greeted by a splash of vibrant colours on its 'ok-handsigned' sofa chairs that seemed like a kiddish cafe, there was also a bar top at the side and further in, there was a proper Chinese restaurant setting with round tables covered with white table-clothes and a formal dining dresscode by its service staff. It felt like a total mis-match for us and it took a while before we could finally get over it and focus on its food. 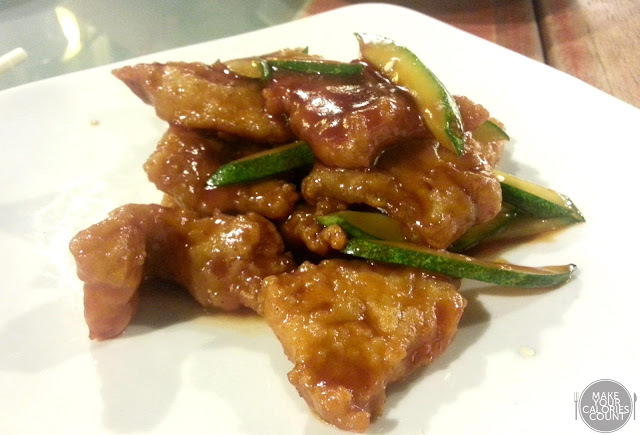 This came a little too salty for our palate, but we were pleasantly surprised by the tender pork that greeted us. It was a good mix of the lean meat with fats, such that it didn't get too tough for us to chew on. This would have been a perfect pairing if you were to order it with white rice, and I would have loved it even more if it has been slightly fried to give its skin an extra crisp! Not exactly an ordinary dish to order for dinner time but our random cravings decided to kick in and gosh, it was a choice that we didn't regret! Cut in standardised bite-sized cubes, it was slightly pan-fried for that crisp and sinking our teeth into the soft insides, mixed with the slightly sweet XO-sauce and fragrant egg made us go 'whoa...' and finally managed to divert our attention from its interior design. I'm typically not a veggie person and definitely against towgays usually but for the sake of completing the experience of this dish, it actually got me hooked! 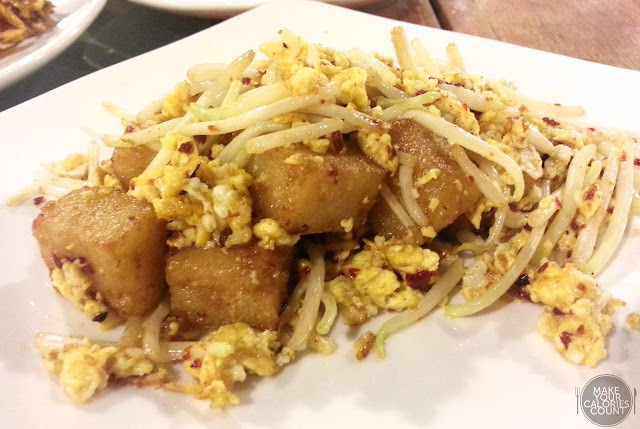 The beansprouts were cooked well enough to not have that strong raw taste to it, yet having a slight crunch and sweetness to complement the dish. Ordinarily-looking dish done well! Perhaps just like any other cooked food, best to have it while it's hot, so you can almost feel the radish cubes melting in your mouth! A unique twist to butter prawns, we were quite looking forward to this. It was also perhaps with expectations, that came with disappointment. We had a pretty hard time de-shelling the prawns, with its flesh sticking onto the shells most of the time. 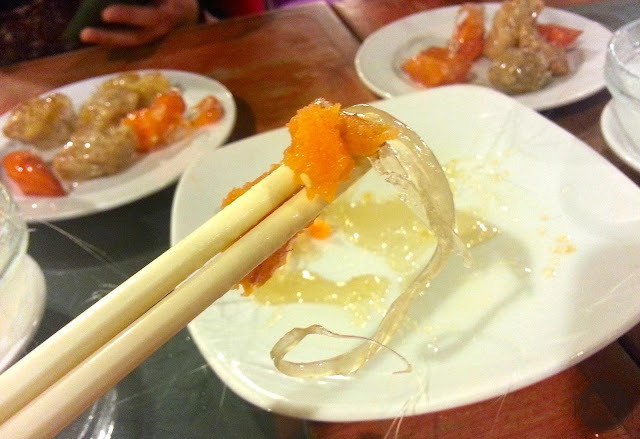 After painstakingly removing the shells, the first bite was already a no-no, with dry and stiff insides. The sauce wasn't fantastic as well, without any signs of pumpkin. 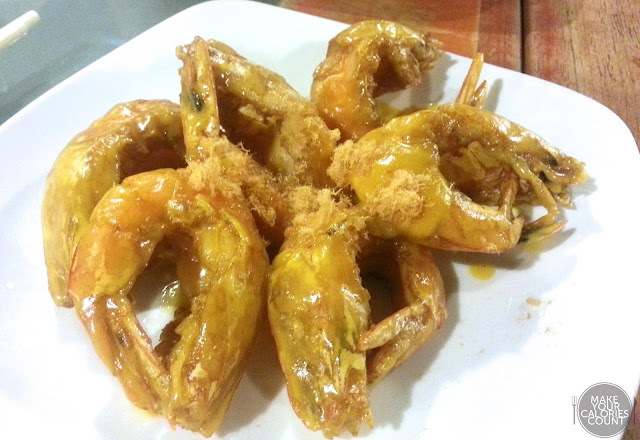 It tasted just like normal butter prawns and wasn't really worth the effort peeling. You can only probably taste a very very slight tinge of pumpkin sweetness when you taste the sauce on its own, and with a pretty sharp tongue. This was the small portion but came pretty sufficient for 3 persons to share. We thought this was a must-order since almost every table had one of this, and perhaps we'd just added on to the perception. There was quite a generous amount of seafood that came along and these actually tasted quite fresh to go with the noodles! In fact, one of my friends commented that the prawns were more succulent and juicier than the Pumpkin Butter Prawn dish that we ordered. Without the shells to peel and a crunchier texture, I did enjoy the prawns here better, and loved the big soft pieces of scallops! 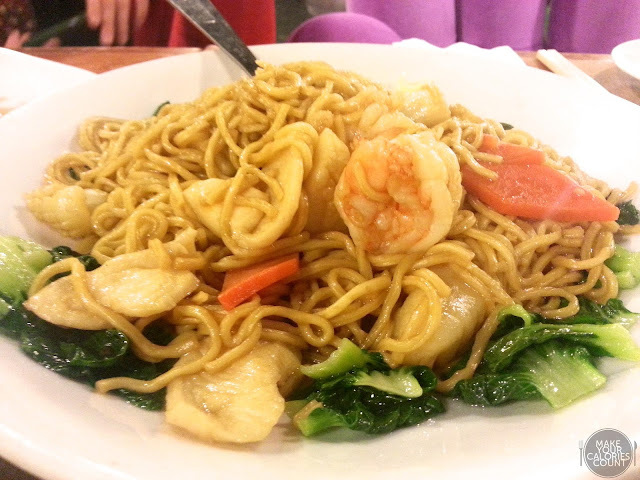 The noodles had a strong seafood taste to it, unlike the usual E-fu noodles, and I thought it was a little overcooked. A lovely addition to our meal, this was a simple dish done well. 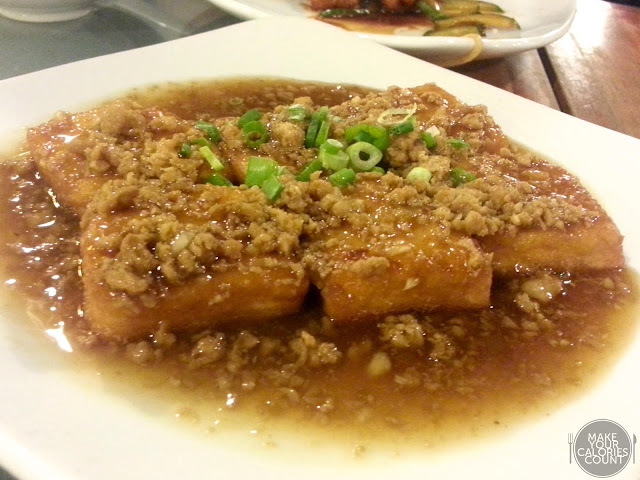 With a crispy beancurd skin, it went well with the savory sauce and minced meat, and an absolute delish when you pop in it while it's hot! The picky eater in me thought it would have been perfect if the insides were smoother, but this was good enough to satisfy. It came to us as a surprise seeing the range of desserts they have and the interesting concoctions. This was quite unlike what we usually see at Chinese restaurants, typically having a limited range of desserts that we would usually go somewhere else for a second round. I thought this was quite an interesting one, with a strong sweet hawthorn taste to it, but ending with a slight bitter tinge from the wolfberries. The flavours managed to go well together, great for hawthorn lovers! This felt like a perfect remedy to combat against the haze recently. Indeed, it was a refreshing one with its menthol slowly kicking in with every mouthful. 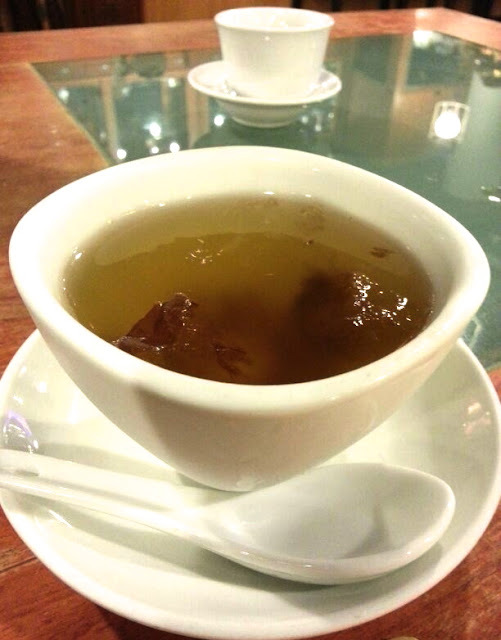 There was just a very slight honey sweetness to it, and it definitely soothed my sore throat quite a bit. 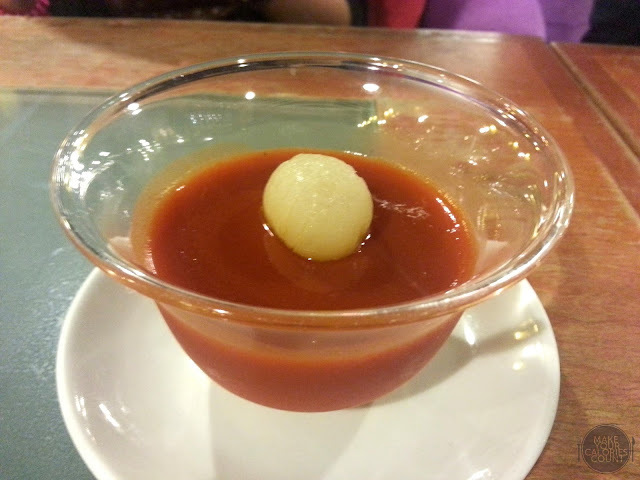 Great to end off your meal with this light refreshing bowl of jelly! It took a while for me to finally understand what she meant and basically we were all so hyped up 'playing' with this! It was quite a scene trying to remove the cubes from the melted malt candy and transferring it to the bowl of iced water. Halfway through the Assistant Manager popped by and praised us for our accomplishment of removing everything from the plate, saying that we were pretty experienced! Removing the cubes from the pile while it was hot and soaking it in cold water enabled the outer layer of candy to harden but probably as we removed it from the bowl a while after 'dumping' it inside, the warmth of the sweet potato and taro cubes were still well preserved. The outer layer of harden candy gave the crunchy bite to it and the warm soft insides, coupled with the natural sweetness totally bought us over. Typically not a fan of taro cubes, this pretty much amazed me by the quality of taro chosen, fine and naturally sweet, it was soft yet wasn't mashy nor grainy. The candy wasn't too sweet to give you the jelat feeling after eating and in fact, we couldn't get enough of it! Coupled with the experience and the epic taste, we thought that this was a die die must try dish! 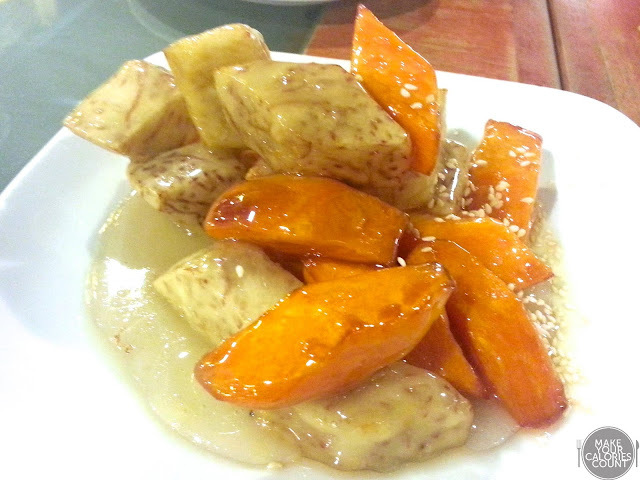 It was lucky that we stumbled upon it with sweet potato cravings as it didn't seem to have any special feature on its menu or seen as a signature dessert dish. Be sure to try this while you're there and all of us agreed that it's a dish that'll bring us back again! Definitely a satisfying ending to our meal! Comfortable sofa seats but absolutely mis-matched with the tables and background. A surprisingly great find that managed to satisfy all our picky palates, there were some hits and misses of course but we found the overall food standards above average. A great place to chill and catch up, as there weren't much queue when we went at about 8ish, while other restaurants had snaking queues sighted. Service staff were also extremely friendly, despite how we had so many requests and there were no signs of chasing us away even past their closing hours. I will definitely be back soon for their candied fritters again! I've been to the one at Metropole Hotel ages ago & food was good. So sorry to learn about the Pumpkin Butter Prawns; I would've picked that too. Too bad. The prices are fairly economical tho. Have a wonderful week ahead, CY!